Back in August, the Lenovo Yoga Chromebook 630 debuted with a 15.6-inch FullHD display and the promise of a 4K option. 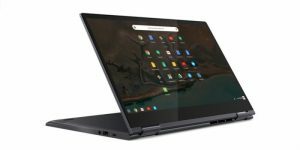 The base model went on sale in October, the availability of the 4K version from Lenovo can now be directly order this 2-in-1 Chromebook with a 3840 x 2160 touchscreen for $899.99. Lenovo’s website says that any orders placed today ship out “in more than 5 weeks”. You can get one of the most powerful Chromebooks along with an ultra-high resolution screen: The first 4K display on a Chromebook. Essentially, you’re paying $180 for the higher resolution display and the backlit keyboard (an upgrade from the 1080p model sold at Best Buy), which isn’t bad but it’s not something most users probably need either. If you have access to 4K video content, it might be worth the upgrade. The information for this post is from an article by Kevin C. Tofel in About Chromebooks, follow this link for the complete article and more details. Here are some additional sources to get different viewpoints on this new model: 9TO5 Google, liliputing, ANDROID AUTHORITY, and ANDROID POLICE.